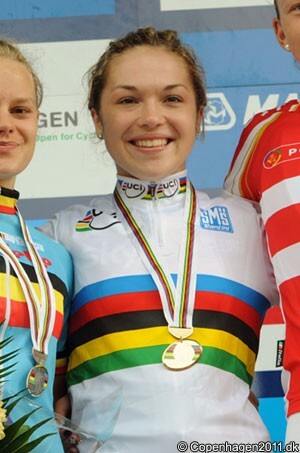 She’s twice won the rainbow jersey in the junior categories but turning senior and joining the Argos – Shimano women’s pro team means that Lucy Garner is facing a big step up in 2013. The Briton has said that she will need time to adjust and is looking at this season as a big learning experience. Argos-Shimano counts ten women, among them Kirsten Wild, a Dutch sprinter. Garner won both world titles in a sprint, but realises that she might have to sacrifice some of her own chances this year. “I just love the buzz of the sprint but I think I’ll be part of Kirsten’s train mostly this year,” she accepted. That ability helped her secure her second world title in 2012. That result plus the European title she picked up in the Netherlands means that people hold big expectations for her. She accepts that, but also asks for patience. “I ride very well under pressure. If I don’t put pressure on myself, I can’t deliver the goods,” she said. “But don’t expect big things from me in this first year. “I don’t expect to win straight away. My expectations are really quite low. I want to learn from the older girls. To me 2013 will be just one big adventure. Given what she has achieved, he likely feels the same way about her.